Curio and art shops and studios for shopping for that special piece for your home or gift. Downtown Loreto is for walking around in. Living in the core makes you part of its pulse, where gringos mix with the welcoming Mexicans of Loreto going about their everyday lives. Dancers, musicians, and activities on the historic town square and enjoyed by everyone. Wonderful locally owned restaurants, bars, and dozens of taco and hot dog (yes, hot dog!) vendors provide great options. Curio and art shops and studios for shopping for that special piece for your home or gift. A wonderful bookstore full of Used and New Books and specializing in books about Baja. Water activities companies and pack trip specialists are here to help you make the most of our most valuable resource – nature. All of this within a few blocks of the square. The beach front north and south of the core of town is for fishermen and boaters and everyone who just loves to be by the shore. Many homes in this area have boat garages or open boat storage and they’re all less than a mile from the public boat launch at the marina on the Malecon. Most have views of the water, or direct access to it. All are intimately connected to the Bay of Loreto. Back streets and side streets within the town, and ridges and hillsides above it, offer every kind of opportunity to mingle with your neighbors and be part of this historic community. The Villages at Loreto Bay, just five miles south of town, is a place for vacationing and relaxing – with restaurants, a wine bar, and small service businesses of all kinds, and a golf course, all integrated into an area that, much like downtown Loreto itself, invites you to stroll around instead of getting into a car. It’s self-contained, yet within easy reach of the restaurants and activities of downtown Loreto. Outside the town are ranches, small beachfront enclaves such as El Juncalito and Ligui, and for boaters the fabulous natural harbor of Puerto Escondido and the mini-village of Tripui. 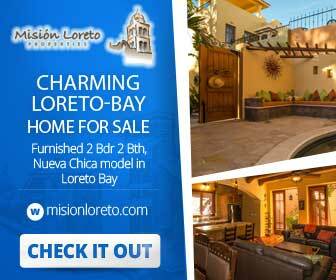 Loreto real estate is as varied as you would like it to be.